THE most beautiful ideas- IN the most beautiful PLACE! Update note: May 4 – The block of rooms we reserved for this Prades event are all booked- but there are a few more places in the conference – if you find our own lodging. Welcome party included with beverage and snacks- begins 7:30-8pm – til 9pm – at main venue. Paul discusses his life long history in frequency and plasma based healing technology – and how this beautifully set the stage for THERAPHI. 12:00 noon- Paul Harris – continued: Theraphi plasma work in practice- introduction to the hardware, practical application, and summary of many users reports. Includes time to work with the new THERAPHI system- mounted righted in the beautiful adjoining room- right on the mountain energy line. 1:00 pm – LUNCH – served on the beautiful deck- overlooking the most stunning mountain view ever. 2pm-3pm – Rest- free time- Pool- Tennis- Walk in the Park/ Watch the Mountain- Trampoline- Fun time. Fractal Field theory – starting with the basics- leading to the breakthru physics. 4:30pm- Dan Winter- Practical APPLICATIONS of NEGENTROPY / FractalField theory. ENERGY, HEALING, REMOTE ENERGY and HEALING, ‘STARGATES/WORMHOLES” Shemanic Implications- and Global Synchronized HEALING Apprication. 7:00 pm- Beautiful group DINNER on the DECK. Evening concludes with Magical Angelic HARP Musics with Alan Moore- who is serious clairvoyant craftsman of deep Golden Dawn/ Angelic Ritual. Introduction to and Deep History of REAL ALCHEMY- from Rich Esoteric History – to the Current REAL PRACTICAL USEFUL EXAMPLES of HANDS ON ALCHEMY- with Paul- a world leader in this field. HOW and WHY does the ALCHEMIC – recombining the distilled essence of the oil, the matter, and the charge of the plant subatance- produce a REAL FUSION REACTION- and what does this tell us about practical FUSION and IMPLOSION. 12 Noon: Paul Harris, Dan Winter- other tech team members present- panel discussion- Breakthrus in new energy technology – from our current team on Implosion Science and Conjugate Fractal Fields. Connection between centripetal forces in ENERGY /FUSION science- to breakthru’s in AGRICULTURE- (www.theimploder.com) – from Restored Centripetal Forces- like agricultural ORMES-.. and other monoatomics/ Effective Microorganisms and more. 2:00pm BREAK- enjoy the magical surroundings / rest. “Stargate Science” behind John Dee and Shakespeare- and actual ALCHEMY. Actual possible destiny of humans to meaningfully project their plasma aura- thru the Sun- and thus evolve into stellar beings. IS plasma projection / physics of new propulsion actually revealing by the conjugate physics of ancient letters- and how does this replace transportation technology AND teach us lucid dream/ after death plasma navigation. 4:30 pm- Dan Winter- with Teresa Burns PhD: New SCIENCE Reveals- Deep HISTORICAL Interpretaion of Spiritual History: What does the new information about HERMES Cadduceus BEING Phase Conjugate Plasma science- tell us about ENKI- and the “ET ORIGINS OF DNA” (Dan Winter)– leading to Dr Teresa Burns: What do the apparent re-incarnations of Edward Kelley /vs John Dee – vs Vincent Bridges “Thru the Veil” sacred skills- vs the new meaning of science in the SHAKESPEARE story- tell us about- turning points in history created by breakthru’s in understanding plasma science. 6:30 pm – Beautiful Dinner on the Deck. This is a sequel to ..
8:30- 9:30 PM- International – ONLINE- Open shared Thereaphi plasma- story telling- ALL invited– – with background sweet Angelic Harp Music from Alan Moore. 9:30 am- Meet at Conference Venue- Open discussion and review, Q&A – from yesterday’s presentations. History of Heart Coherence and Brain Coherence and Brainwave Bliss Biofeedback- visual review of HeartLink, HeartTuner, HeartsRing, and now iTHRVe.com – intros with lots of visuals. 10:30 am: Patrick Botte: – Patrick is our main programmer of itHRVE.com , hrv-app.com . craniosacral-app.com , and flameinmind.com. This morning however is focused on HOW HRV / Heart biofeedback works- applying it to the 3 Major APPS at itHRVE.com: itHRVe for SacroCranial Measure, itHRVe for CHAKRAS measure, and new : itHRVe- for STRESS REDUCTION. TRY the 4 difference sensors: Chest Strap (long term sleep analysis), Finger Clip (includes Blood Oxygen and Breath Feedback) , Ear Clip (super comfortable), and even just with the iPhone camera light sensing your pulse. TESTING your heart HRV -WITH THE THERAPHI- can you measure the Theraphi induced Spine Liquid STILLPOINT – Healing turning point. Sacral Cranial Zero point- measurement with itHRVE-vs MAYER WAVE and .1hz HRV LF. 2:00pm – BREAK- last chance- enjoy the beautiful parks and playthings at both venues. See MUSE- wireless brainwave headset transmit to iPhone / iPad / IOS- see how alpha brainwave and serious meditation science is measured. See how binaural beats well designed can CREATE BLISS/ ENTRAINMENT- measured in EEG- with flaminmind.com and MUSE! Deep discussion about advanced meditation and healing techniques with HRV/ and EEG biofeedback- including intro to remote viewing/ astral projection vs BINAURAL beat brainwave physics. Comparison to TOMATIS- (with Patrick)- and pointing toward a deep shamanic science of plasma control / tornado steering – with Biofeedback empowerment. 8:30 pm- Open Discussion- lets discuss the future of energy healing- and creating planetary education with new insights and tools!.. and farewell. Closing Harp Music and meditation. Monday: July 25: Breakfast at lodging- final farewells- and departure. From Perpignan Airport- let us know your arrival- we will arrange pickups July 21- generally between 1-7 pm- – and drop off return July 25 leaving venue AM. From Prades Train station to venue: let us know your arrival time- or- venue is pleasant 12-15 min.walk. (Venue addresses at links above). Meals – Lunch and Dinner- included with conference cost- primarily beautiful vegitarian excellent food- with some options of mild fish / seafood- ( one evening is planned as wholistic pizza party with many options). Excellent breakfast is included for those choosing lodging option. Update note: May 4 – The block of rooms we reserved for this Prades event are all booked- but there are a few more places in the conference – if you find your own lodging-see option B. Arrival after 4-5pm on July 21, Depart mid to late morning- July 25. 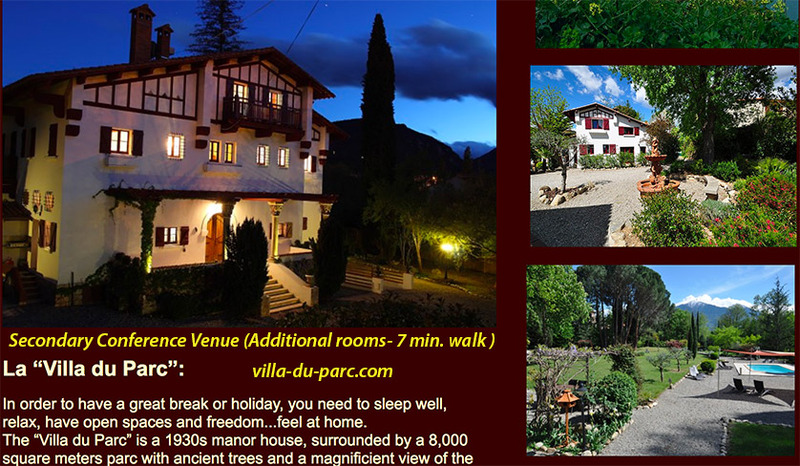 Lodging option B: find your own lodging- any fun place in Prades, 66500 France- or Perpignan (30 min.) – or as you like- and join us 9:30AM – each of 3 days- above with lunch and dinner finishing about 8PM- all included in basic conference registration. Lunch will start 12:30 to 1PM, Dinners 7PM.